Posted in Arts, Look East on April 28, 2016 by Shonali Ganguli. 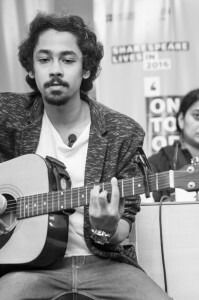 Actor Riddhi Sen, who was part of the Shakespeare Day celebrations at the British Council in Kolkata on 23 April 2016, writes on how it’s essential to keep performing and reinterpreting Shakespeare. William Shakespeare wrote plays on kings, soldiers and empires but even now his work perfectly fits our surroundings. Surprising, but if we really look around it makes perfect sense. As a citizen of West Bengal it’s really wonderful to see how Shakespeare has been adapted on screen and stage repeatedly in recent times. There seems to be an urgency to adapt Shakespeare. What’s more interesting is that his plays don’t require interpretation. They fit smoothly into any situation. The great Utpal Dutt staged Macbeth in the time of Emergency. In recent times we’ve seen a lot of Shakespeare in Bengali film and theatre. I have been really privileged to be a part of the play Macbeth, directed by my father Koushik Sen. The play gained a lot of accolades, including a review by Andrew Dickson in the Guardian. What amazed me was how Macbeth defined the exact socio-political situation of 2012 Bengal. It’s really inspiring to see how Julius Caesar becomes the story of Kolkata’s underworld in Srijit Mukherji’s Zulfiqar. This gives me confidence as an artist to find out how Shakespeare’s plays live and breathe in my surroundings. It creates an insatiable desire in me to be a part of this gigantic yet human world of Shakespeare. It creates a sense of urgency in me to work with his plays. Maybe I’m not mature enough but instinctively it forces me to deal with all his characters and bring them under one roof in the form of a play or film. I was amazed and inspired when I saw Kashmir become the setting of ‘to be or not to be’ in Vishal Bhardwaj’s Haider. It’s really important for our generation to realise that it’s just not important to interpret Shakespeare but it’s a bigger responsibility to make the plays more approachable for the masses. It’s more important to uproot the notion that in order to understand Shakespeare it requires a great deal of knowledge and maturity.